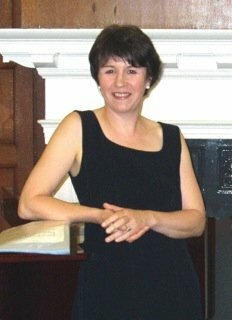 Siân Carys (soprano) was born in Cumbria and studied with Belle Wybergh. She furthered her studies at the RCM where she won the French prize for singing and studied piano as her second instrument. After graduating with a Dip RCM (teachers for singing), she won a bursary from the Oppenheim John Downes Memorial Awards for a further year’s study with Audrey Langford followed by coaching from Martyn Hill. Prior to college she studied with Henry Muller (relative of Myra Hess) (pupils Shirley Bassey, Diane Todd, Julie Andrews); Llewelyn John (Guildhall School of Music and Drama), Stephen Pettitt, Margaret Cable (RCM) and in recent years Sian has studied with Glenys Linos (pupil of Elvira de Hidalgo - Spanish coloratura who taught Maria Callas) and Stephen Wilder (originally coach at the ROH). July 16th - July 21st 2001, she sang “Sempre libera” from Verdi’s ‘La traviata’ accompanied by The Royal Artillery Orchestra and in 2007 she sang in St Mary’s Cathedral, Edinburgh accompanied by John Bryden to raise funds towards a new Steinway piano. August 2009 she was the soloist at a Thanksgiving Service in Southwark Cathedral, London (full congregation) for NHS Blood and Transplant. In December 2015 she was the soprano soloist accompanied by the Temperamente Quartet to raise funds for the Flood Disaster in Cumbria and will be performing again with the quartet in the closing concert of the Brampton (Cumbria) Classical concert series in October 2016. London concerts include St George the Martyr, Borough; Bloomsbury Central Baptist Church; St James' Church, Piccadilly; Kings and Chelsea & Westminster NHS Trust Hospitals and the Savoy Hotel. UK recitals inc. Lincoln, Winchester, Ely, St Nicholas accompanied by Michael Stoddart, Llandaff, Blackburn, Ripon, Cathedrals; Tewkesbury Abbey, Ewenny, Lanercost & Malvern Priories; Lake District Summer Music (Grasmere & Hawkshead churches) & Edinburgh fringe festivals. Wolfson and Robinson Colleges in Cambridge, the Great Hall at St Bartholomews Hospital (in the presence of Thomas Dausgaarde) and Penrith and Lockerbie Music Societies. September - St Giles’ Cathedral (St Giles’ at Six concert series), Edinburgh accompanied by John Bryden. October - St Martin’s Church (‘Last Night of the Proms’ - Brampton (Cumbria, UK) Classical Concert Series). November - St Nicholas Cathedral, Newcastle. In addition to her performing and private teaching, Sian teaches singing to young people who have experienced significant interruptions in their lives. Sian gives regular vocal workshop in Higham Hall in the Lake District **Web Address Removed** for three workshops in 2019. Her philosophy is to ensure her pupils/students will always enjoy music whether they continue towards a music career or for just pure enjoyment and fun. SianFrom Sean (5/5): went for my first lesson with Sian . Reply from: Sian: Thank you Sean for your great feedback. It is always appreciated and I am glad you no longer need to worry. I look forward to helping you learn to play the piano.